The secret to taking your business from mediocre to meaningfully different? Thinking like a marketer. It’s also the secret to moving your organization from status quo to success story, and from busy to profitable. 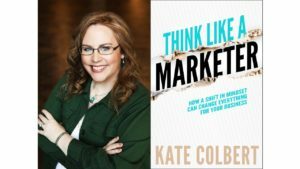 In an easy-to-read, practical new guidebook, acclaimed marketing expert Kate Colbert offers fresh insights into the actions and attitudes that can accelerate your business success, sharpen your daily work, and balance your efforts to create value for customers while capturing value for the bottom line. For non-marketers and marketers alike, truly thinking like a marketer requires the right framework, and this book is everything you need to make the mindset shift that can change everything for your business. If ever there was someone who had all the perfect excuses not to engage a book coach, it was me. I’m a professional writer and the owner of a book publishing company. I know how to write a book, publish it and promote it. But I needed focus, accountability and support if my first nonfiction business book was going to be all I wanted it to be. Having Cathy at my side to guide me through some of the tough decisions, to encourage and enable me to make (and protect) time for writing, and to introduce me to other authors living through the same experiences allowed me to accomplish everything I set out to do with this important book.